Round Robin Tournaments, Minecraft Server Monitor + more! Welcome to the first blog post! I'm really happy to announce over 12 new features and improvements, in addition to our new blog. So first and foremost are round robin tournaments. Last week the tournament system was released and many of you came back asking for round robin tournaments. It's only fair if that's added in too, right? Round robin tournaments have several advantages over elimination tournaments - but they also come with drawbacks too. The first advantage to round robin tournaments is fairness: each team plays every other team, so no one has the upper hand during the initial seed. In a single elimination tournament half the teams are dropped after the first round, meaning there is an element of luck involved. This is gracefully reduced in round robin. The major drawback of round robin tournaments is duration: if you have many teams playing then each team needs to play each other team. The robin round tournaments feature doesn't scale so well with number of teams. If you're running huge tournaments then you're probably much better off using an elimination type tournament. 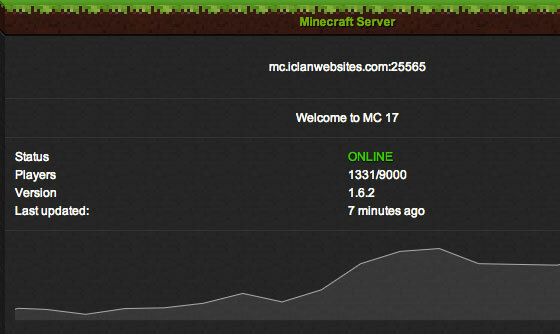 [caption id="attachment_26" width="560"] The new Minecraft server monitor[/caption] The new Minecraft server monitor fetches details such as number of players, message of the day and the version of Minecraft. A history of the number of players is shown in a nice tidy graph. This is the first of the server monitors that have been integrated to websites, more are planned in future updates (please comment below which ones you'd like to see). The new site visitors panel is a simple panel that displays the number of visitors grouped by country. This is particularly nice for multi-national clans & guilds who have players all over. The events panel has had an overhaul due to popular request. The events panel now displays the upcoming events and lets you set your attending status there and then. Tidy! So that's it for now, if you have any feedback on these updates or have new ideas then I'd love to hear them! The best place to post your feature requests is in the feature requests forum. Have a great weekend gamers!